Rep. Pat Meehan will not seek re-election after a New York Times report that he used taxpayer dollars to settle a sexual harassment claim filed by an aide caused national backlash. Meehan, a Republican who has represented Pennsylvania's 7th Congressional District since 2011, informed his campaign chairman of his decision in a letter obtained by Philly.com. 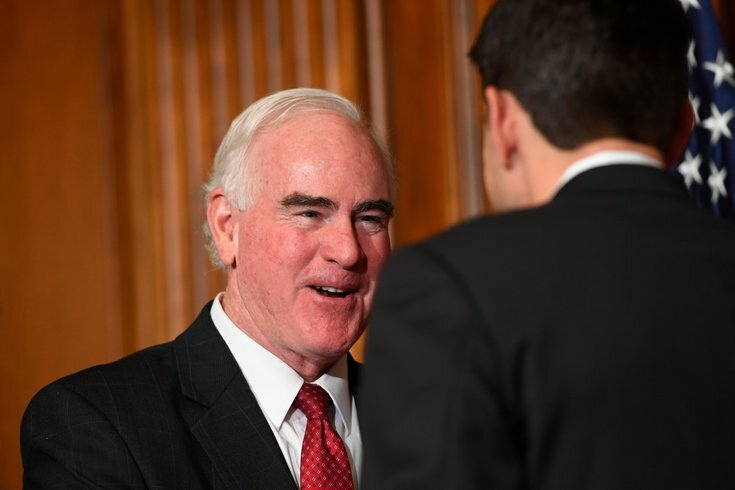 The New York Times first reported last Saturday that Meehan, 62, had used thousands of dollars in taxpayer funds to settle allegations from a woman who accused Meehan of "making unwanted romantic overtures" to her. After the aide, who is reportedly decades younger than the congressman and had regarded him as a father figure, became involved in a serious out-of-office relationship last year, Meehan professed "romantic desires" for her in a conversation and a handwritten letter, according to the report, which cited 10 unnamed sources. Meehan reportedly grew hostile when the woman did not reciprocate. Meehan's communications director, John Elizandro, told the Times last week that the congressman "denies these allegations" and "has always treated his colleagues, male and female, with the utmost respect and professionalism." Calls for Meehan's resignation have grown in recent days. Not long after the Times published its report, Ryan removed Meehan from the House Ethics Committee. Meehan reportedly wrote to the panel, asking it to investigate the allegations. Meehan denied the allegations but attempted to explain the situation earlier this week in multiple interviews. His comments raised further questions, though. He told WHYY that he thought of the woman as a "soul mate," a comment that alone raised national outrage. He also told the site that he had a deep affection for the woman, but never displayed romantic feelings for her. He addressed the "soul mate" comment in the letter to his campaign chairman. “No characterization of the work relationship I shared with a uniquely close colleague could have been more personally harmful than when I described that co-worker as a ‘soul-mate,”’ he wrote. “I truly didn’t even consider or understand the full implications of the use of that term." He also reportedly said that he has never been unfaithful to his wife, is happily married and that "characterizations of a romantic interest in a co-worker are not only unfair, they are wrong."